One of the few maps that covers the entire territory of the Julian Alps, from the westernmost Jôf Fuart on the Italian side to the Lake Bled in the east. Beside the waymarked paths, unmarked trails and ski tours the map includes also: sports climbing areas, natural and cultural points of interest and paragliding take-off sites. GPS, WGS84. 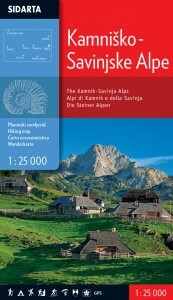 The map covers the all region of the Kamnik-Savinja Alps. 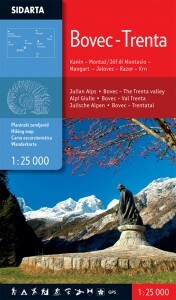 Beside the waymarked paths, unmarked trails and ski tours the map includes also: sports climbing areas, natural and cultural points of interest and paragliding take-off sites. GPS, WGS 84. The map is printed on both sides. It covers the area of the Bovec basin, the Trenta valley and the Jôf Fuart and Montasio groups in the Western Julian Alps. Beside the waymarked mountain paths, unmarked trails the map includes also trails Via Alpina, Soča trail, Alpe-Adria, The walk of Peace and waymarked foothpaths, bicycle routes, tralsports climbing areas, entry and exit points for kayakers, natural and cultural points of interest and paragliding take-off sites. GPS, WGS 84. The map is printed on both sides. It covers the area of the Bovec basin, the Trenta valley and the Jôf Fuart and Montasio groups in the Western Julian Alps. 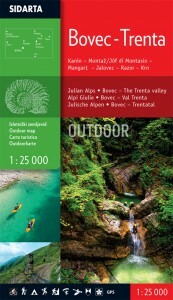 Beside the waymarked paths, unmarked trails and ski tours the map includes also: sports climbing areas, entry and exit points for kayakers, natural and cultural points of interest and paragliding take-off sites. GPS, WGS 84. 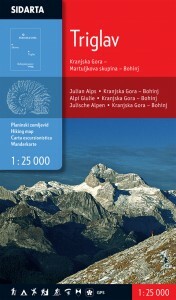 The map covers the area of Bohinj (Triglav – Krn – Črna prst). Beside the waymarked paths, unmarked trails and ski tours the map includes also: sports climbing areas, natural and cultural points of interest and paragliding take-off sites. GPS, WGS 84. There is a list of mountain huts with all the important information on the back side of the map. 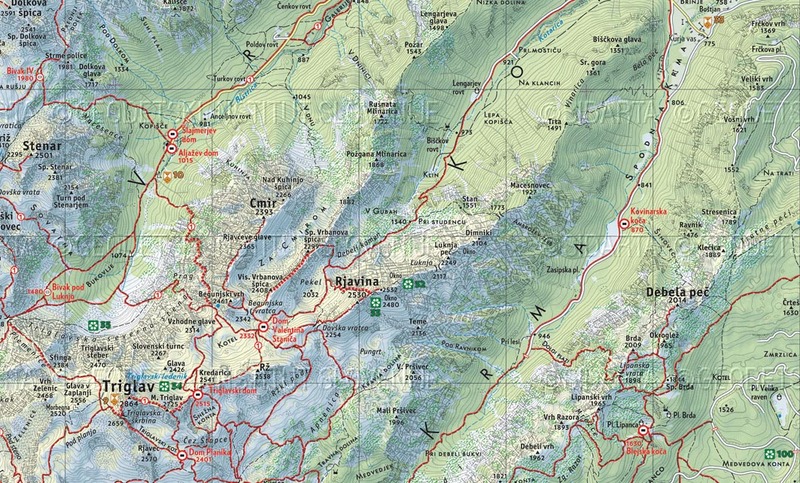 At the 25th World Conference of the International Cartographic Association (ICA) in Paris, the map won first prize in the category of topographic maps. 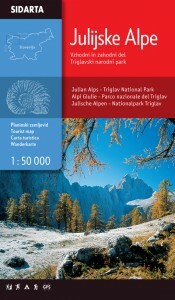 The map covers the central region of of the Julian Alps. Beside the waymarked paths, unmarked trails and ski tours the map includes also: sports climbing areas, natural and cultural points of interest and paragliding take-off sites. GPS, WGS 84. Praise of the international jury at the “6th Brumen, Biennial of Slovene Visual Communications”.